I’ve been kicking this idea around for a couple of years and finally last week I decided to actually do something about it. 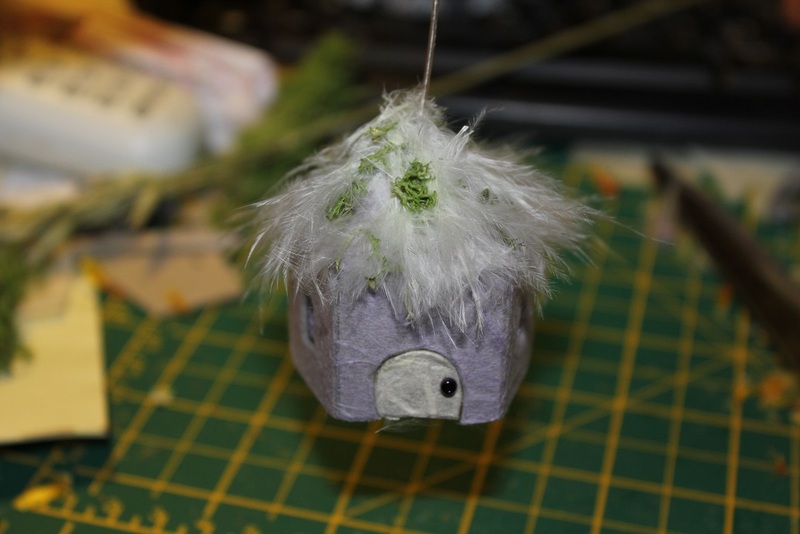 Below I have written a detailed tutorial of how to make tiny fairy house decorations. This project can be as simple or complex as you like and the materials that you can use to decorate the houses are extremely varied so the creative possibilities are endless. 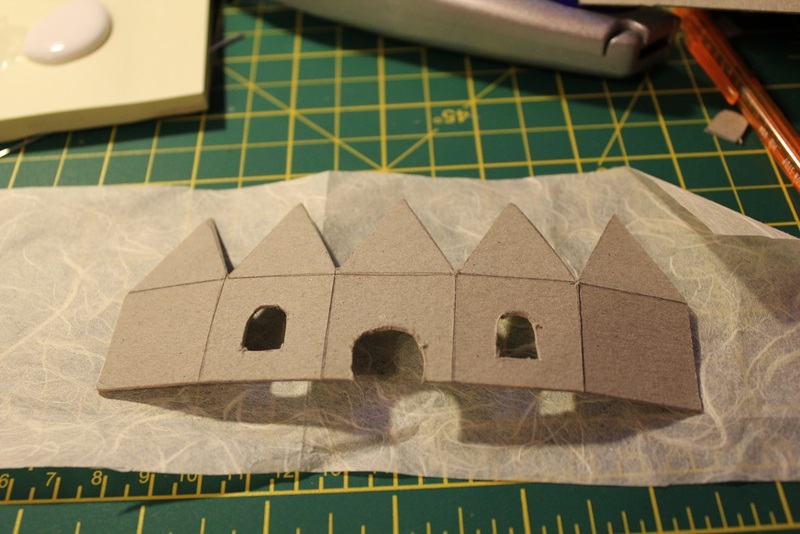 Originally I was going to make the houses much larger but I thought that ornament size would be perfectly hang-able for indoor display and easily manageable if an adult was attempting this project with a child. If you wish to make the houses larger it’s quite simple to modify the instructions. The first thing that you need to do to get started is measure out your templates. 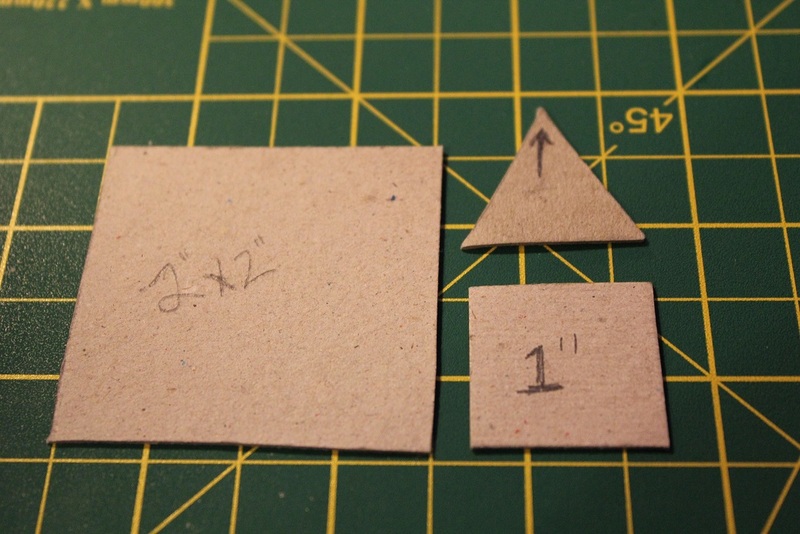 You will need two one inch squares of cardboard and one two inch square of cardboard. Cut them out and put the 2 inch square as well as one of the one inch squares to one side. Then take the second one inch square and measure it’s exact center at the top of one of the sides. Connect the mid point with the bottom corners to make a triangle and mark the most acute angle of the triangle with an arrow so that you always know which point represents the peak. 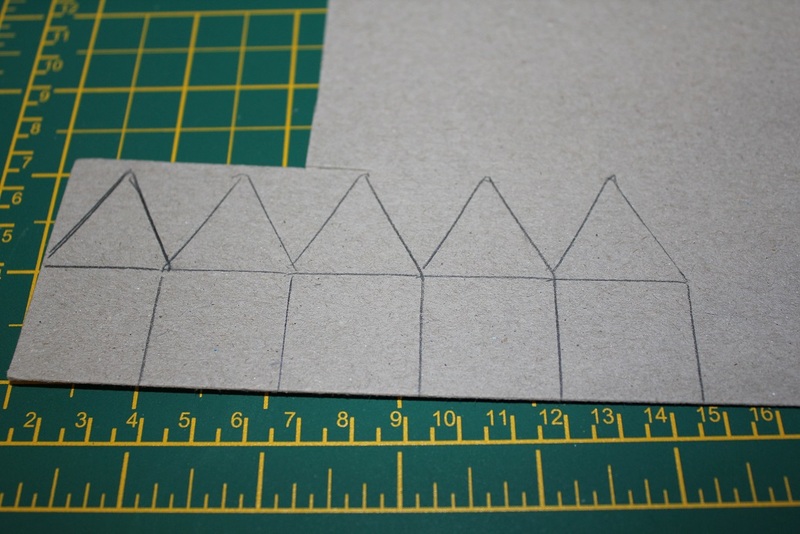 Next take your small square and triangle templates and trace them each 5 times onto the card as pictured above. 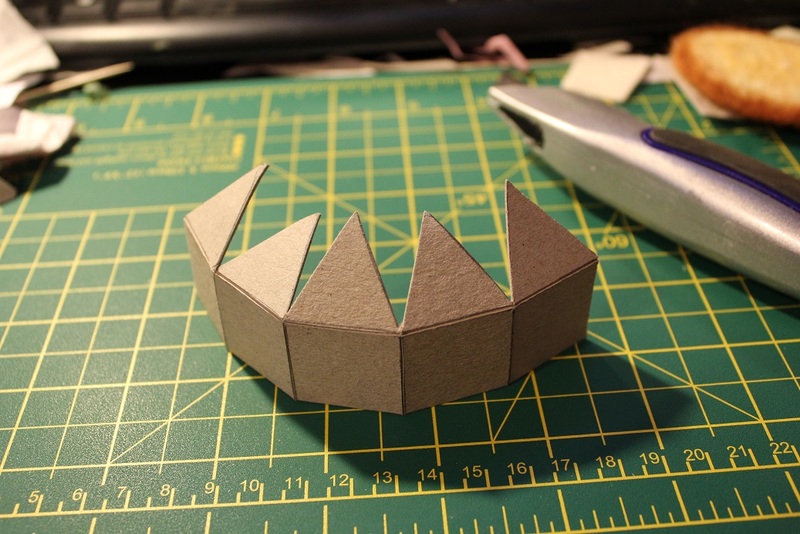 Cut out the shape as a single piece. 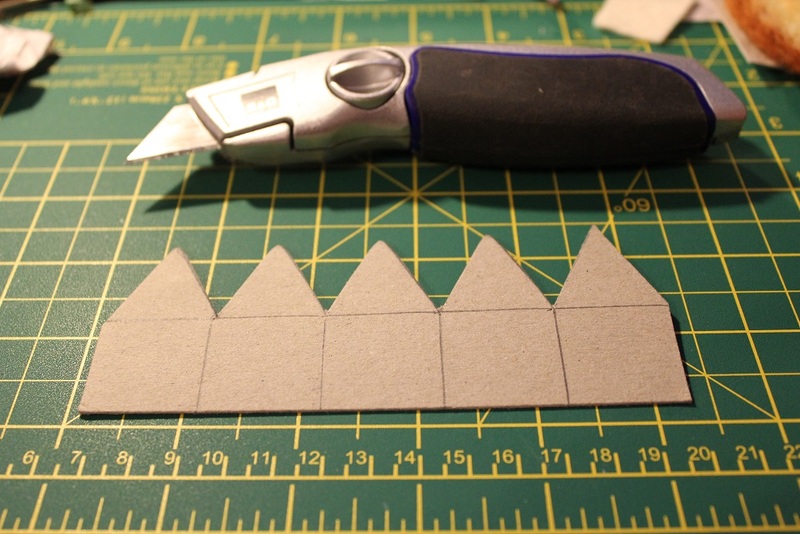 Then take the box cutter or craft knife and score each line very carefully so that the cardboard will bend easily along each cut. If you want windows and a door, draw them on and carefully cut them out. For this house I saved the door piece so that I could reattach it later. If you want to cover the house with paper this is the stage at which I prefer to do it, however it could also be done after the house was glued into a house shape. I found that acrylic paints work really well too so the option is there to do either. 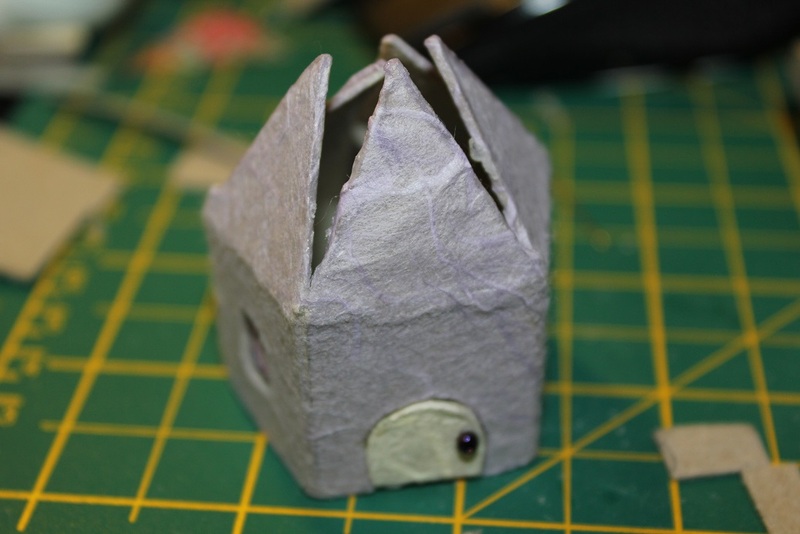 I used mulberry paper to cover this house. Cream on the inside and lavender on the outside. 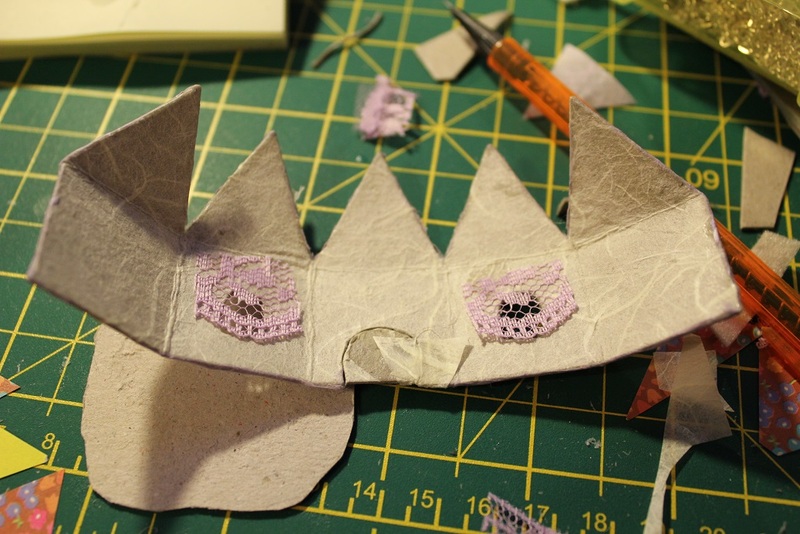 I love mulberry paper because it’s very flexible and versatile. I also love the way it looks so I use it a lot. 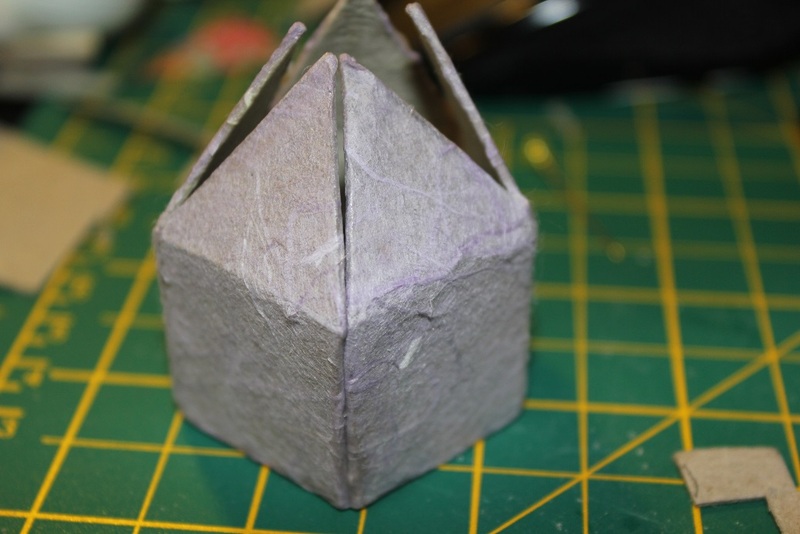 If you are covering the house with paper, be sure to leave a border to wrap around the edges as pictured above because it just looks more tidy without any of the original brown/grey cardboard showing through. 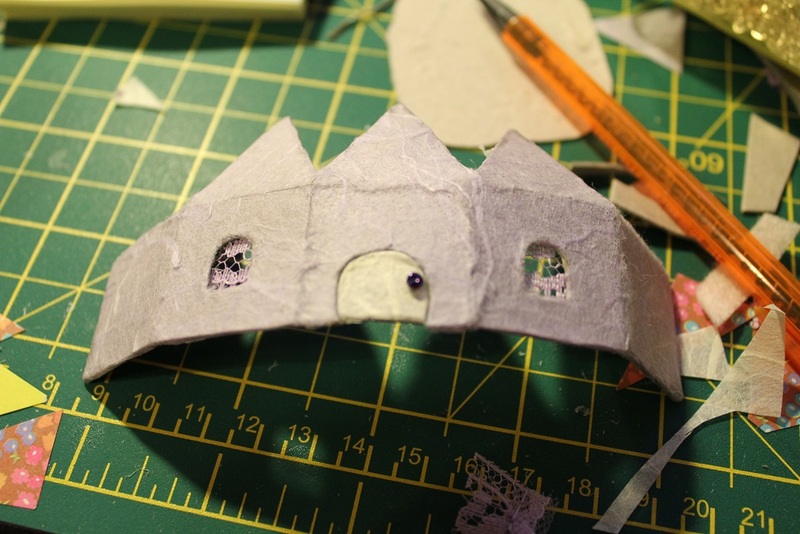 Paper will adhere to the cardboard easily with a thin coat of craft PVA (basically white school glue) or you could probably even use a glue stick. Just be sure to flex the creases before it’s completely dry so that they don’t split open later on. The next step is completely optional but I’ll tell you what I did here. I cut out a couple pieces of lace and glued them to the tops of the insides of the windows to make “curtains” and then I covered the cardboard piece that I’d cut out of the door hole, added a seed bead as a doorknob and reattached the door with a piece of mulberry paper to act as a hinge. Here is what it looks like from the front so far. When you’re finished decorating the inside bits you can glue the house together. Hot glue would be the easiest thing to use but I didn’t want to have to venture into my husabnd’s mancave to find the glue gun so I just used my PVA and held it together for a couple of minutes until it set. 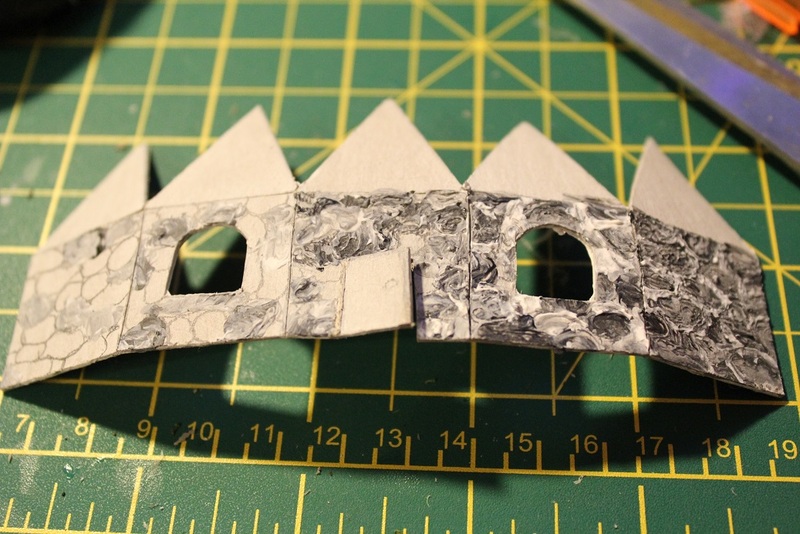 You can see here that the seam is quite tidy and once it’s solid you can do the same with all of the roof pieces until they stick together in a solid peak. 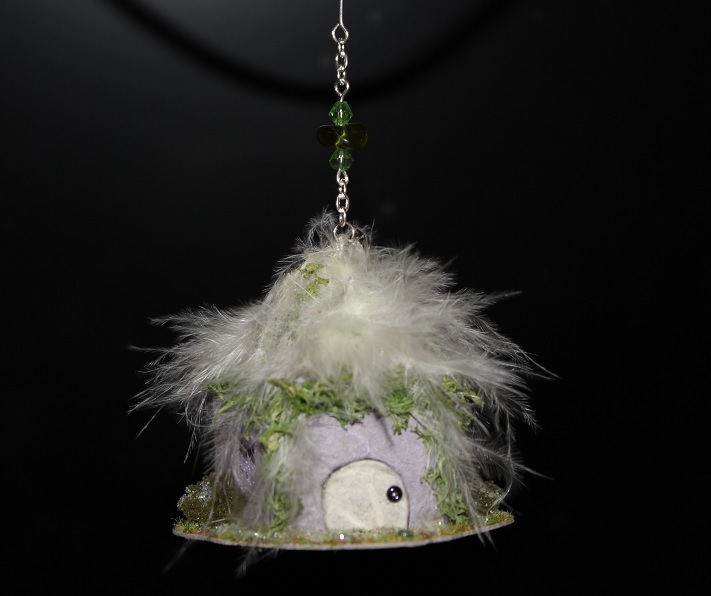 Inspired by birds nests I thatched this roof with (glue) feathers and fake moss pieces. You could also paint the roof or cover it in anything you like. So that the house will hang a loop needs to attach to the roof peak. 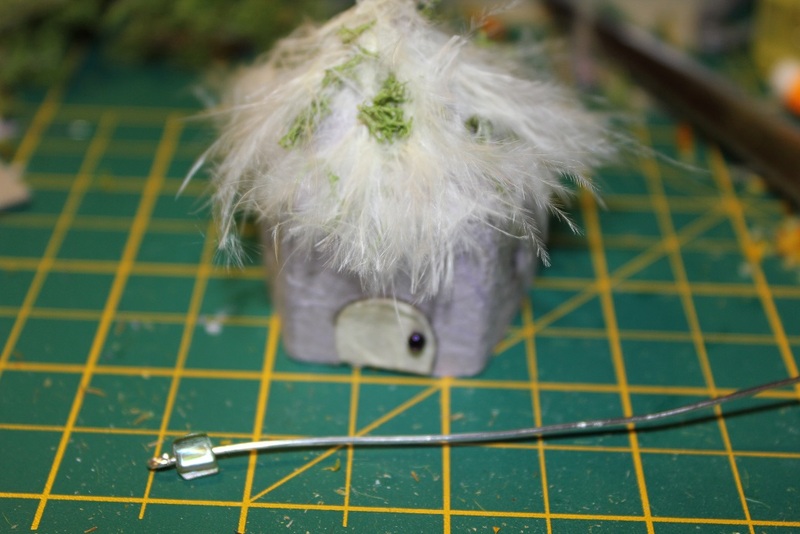 I secured a bead to a piece of wire and then poked the wire through the underside of the house and out the roof peak so that the bead would catch on the inside. I then snipped the wire and bent it into a tidy loop. A loop that was mostly obscured by fluffy feathers. 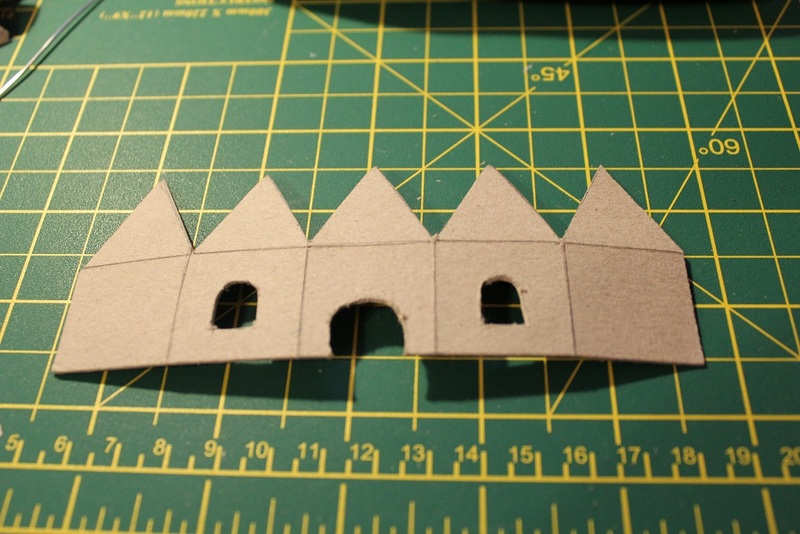 Once the loop is firmly in place you can glue the house to its base, which you cut out using the 2 inch square piece of card. 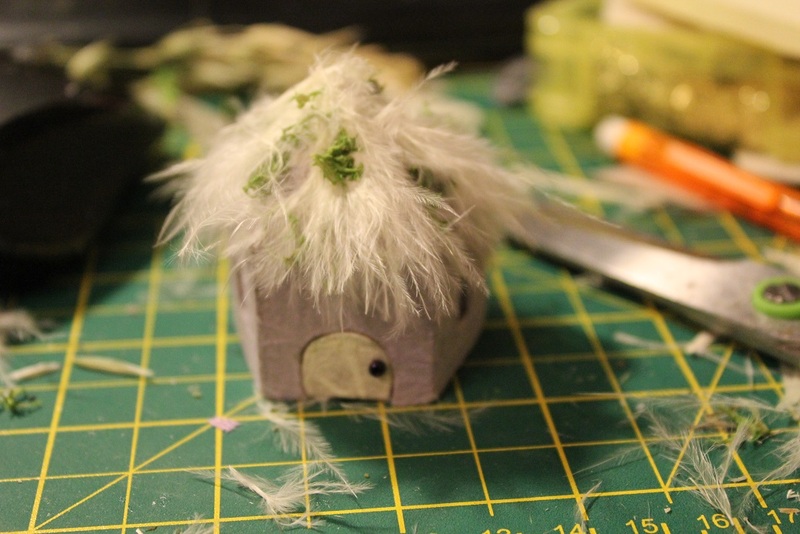 I snipped the corners, glued on the house and then decorated the base with glitter, fake grass and fake bushes. Here is the final house. 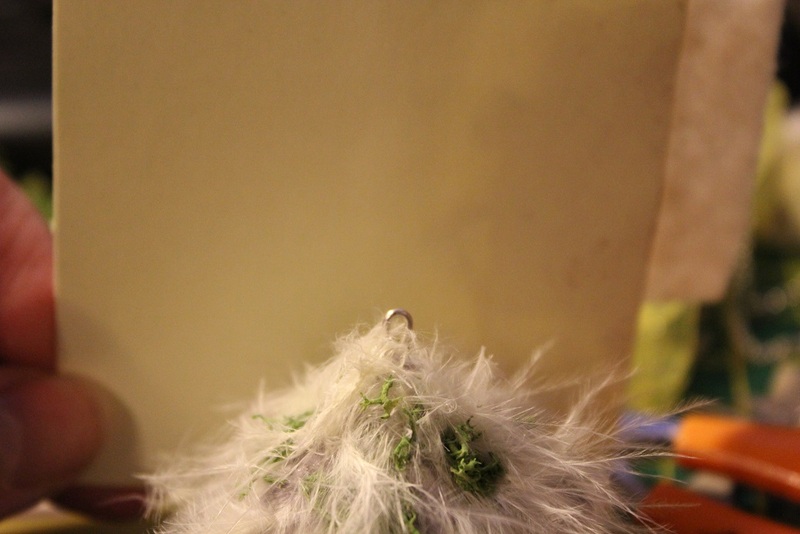 You can see that I also embellished the front with additional fake moss and I added even more feathers. 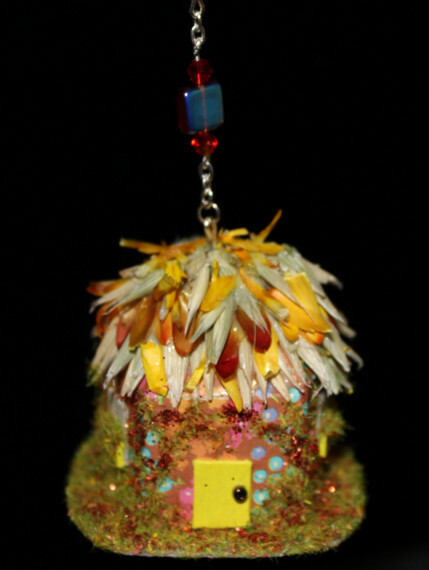 For the hanging bit I used some chain and beads to make it sparkle and then I fashioned a hook at the top with wire. 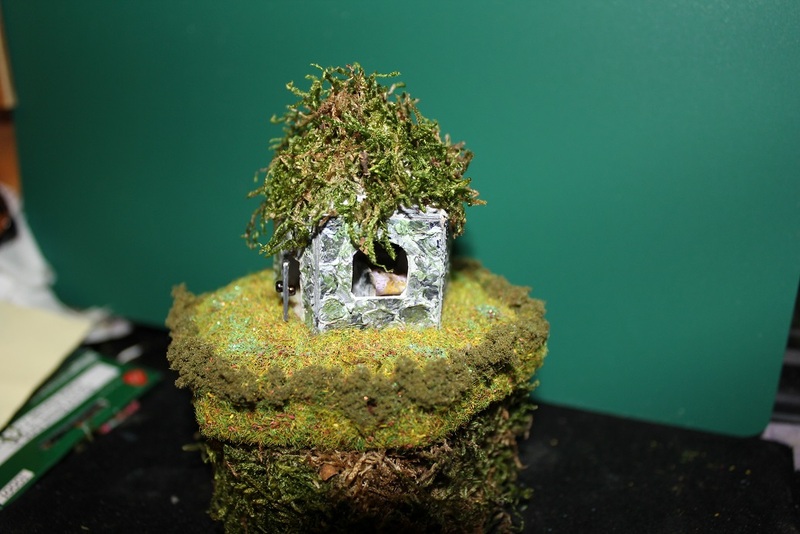 If you are interested in where to get fake moss, fake tiny bushes and fake grass, just look in your local craft store in the section dedicated to model building or anywhere that supplies Warhammer miniatures. These things are also readily available online. My favorite part about this house is that the feathers float around with every breeze (even when you just walk past) which sort of brings it to life. 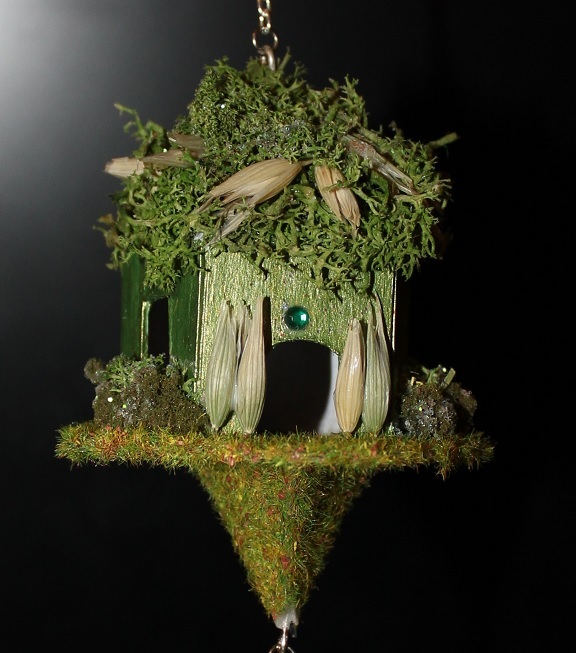 Here is the second house I made using origami paper to cover the house and dried flowers to thatch the roof. 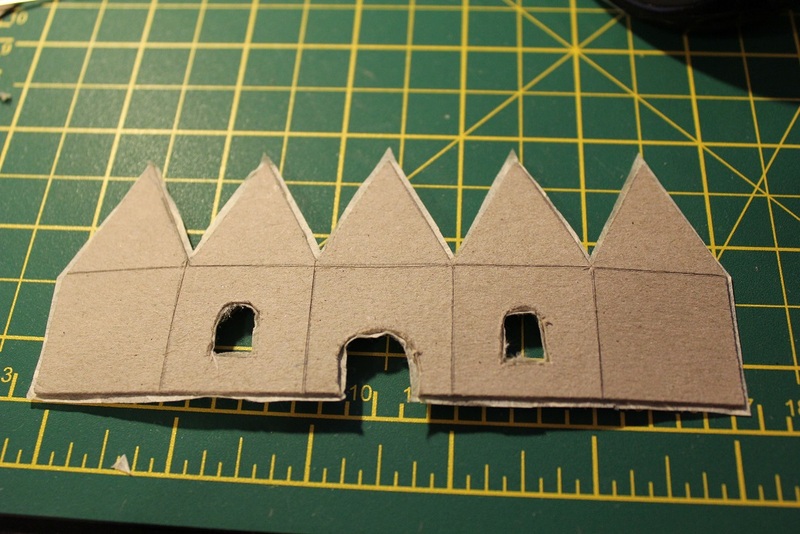 I didn’t cut out the door or windows but instead cut out separate cardboard pieces, covered them and glued them on. 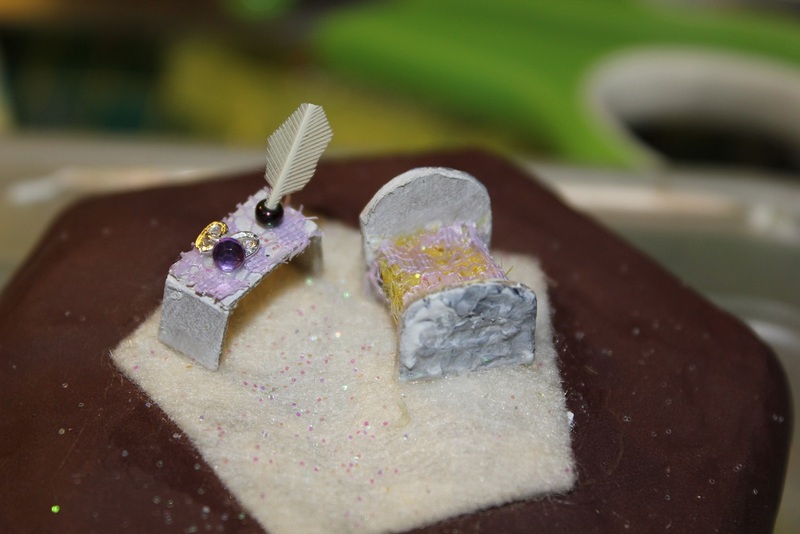 The base and house are also embellished with fake grass and glitter. I admit, it looks sort of garish int he photo but it actually looks pretty cute in real life and catches the light nicely. I took the design a step further with this house by making a pyramid to stick to the bottom. The pyramid was constructed by tracing the triangle piece three times (peak points together) and then scoring them (as with the house), folding them and glueing them into a pyramid shape. 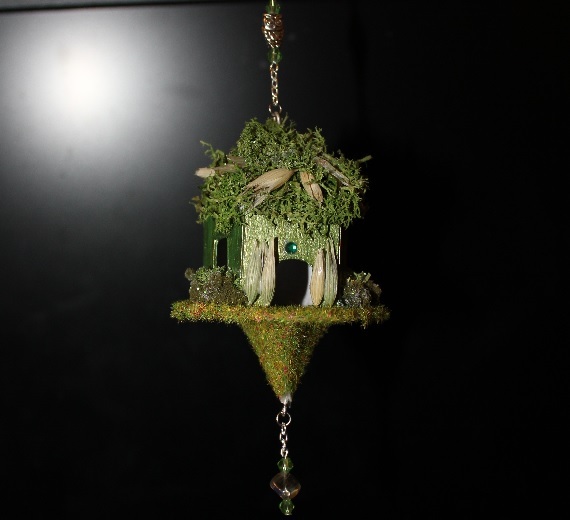 Then I made a loop for that piece just like I did for the roof so that it could have a decorative dangle. The roof is thatched with fake moss and real dried plants. The outside is decorated with fake grass, fake bushes, fake moss and glitter. The exterior of the house is painted with metallic green and I glued a green rhinestone above the door. With this house I’ve also demonstrated what it looks like if you just cut out the door and windows and leave them open. This is the house I really went all out on. It doesn’t hang either, it’s actually attached to a hexagonal wooden box. 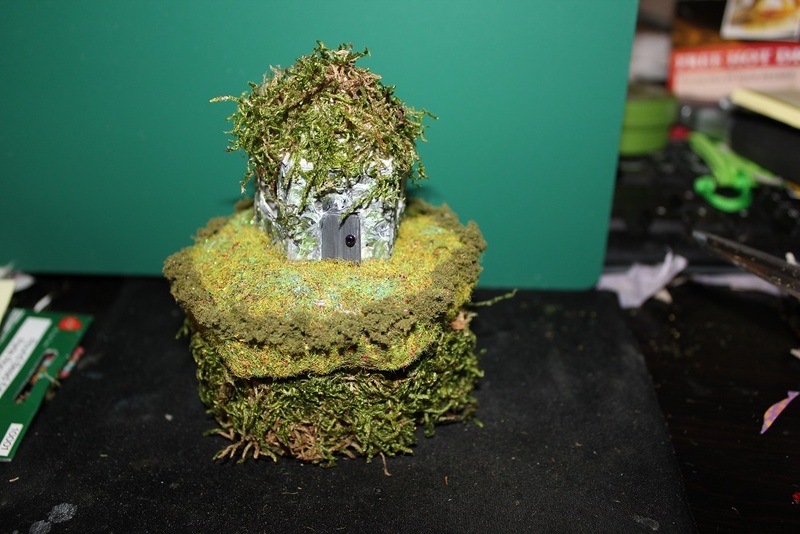 The exterior is stonework that I painted on with a toothpick and the roof is thatched with real moss (very very very messy but worth it). The door opens and closes and the windows are big and open. The reason why the windows are big and open is because I furnished and carpeted the inside which you can see through the windows and the door. I toyed with the idea of attaching an LED on the inside but decided that would have been better suited to a non wooden box as I wasn’t terribly keen on drilling into the lid to secure the power supply. You can’t really tell there is much inside the house from a photograph but it looks pretty cool in person when you peek in the windows. It’s pretty shaggy and I’ll probably think of some other way to dress it up further but for now, I’m happy with the outcome. So as you can see from the examples that I’ve provided, the creative possibilities are fairly endless. I just used craft supplies that I had around and if I had to buy them, to be fair, it wouldn’t have been terribly expensive. In fact, I would love to do a few using purely (free) scavenged materials from outdoors. 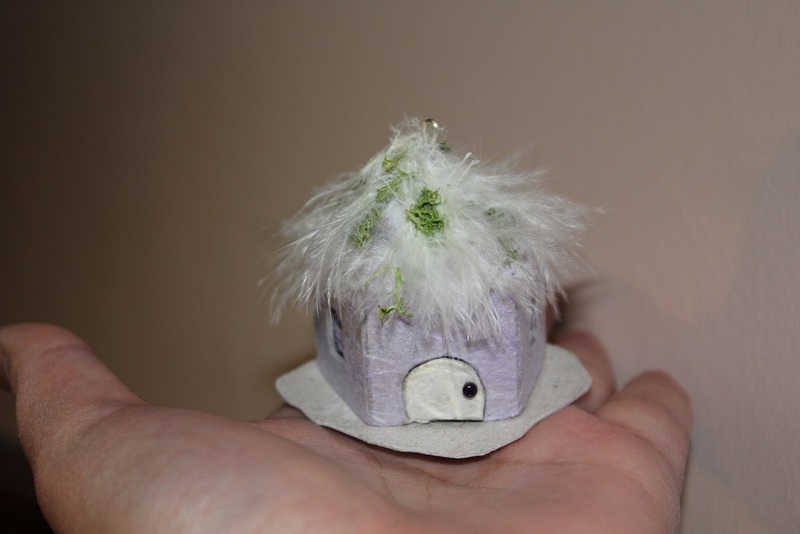 If you make the little houses in advance I would imagine that they would be a really fun activity for a child or a group of children to decorate. My (almost) 2 year old is absolutely fascinated by the three hanging ones and I am really looking forward to making some with her once she’s a bit older.